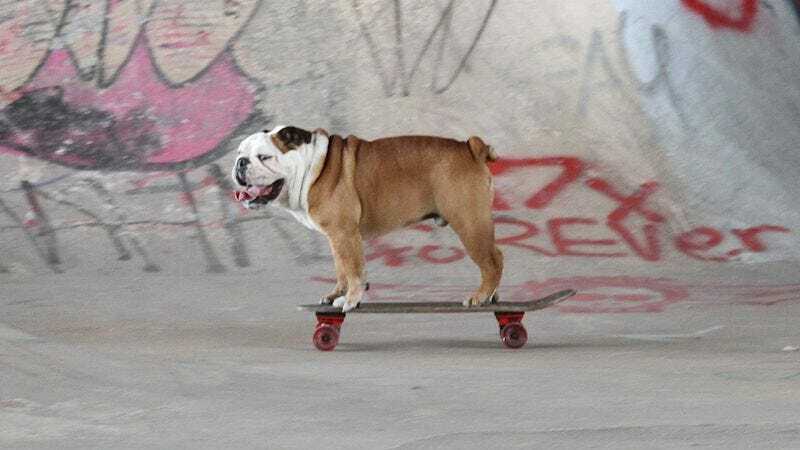 Tillman, the first skateboarding English Bulldog to set the internet on fire, has died, according to The Hollywood Reporter. He was 10 and had developed a heart muscle disease. According to The Ventura County Star, Tillman died Tuesday on the way to a pet hospital. Tillman was owned by Ron Davis, who first posted a video of the dog skateboarding to YouTube in 2007. That video, “Skateboarding Dog,” has been viewed more than 21 million times and earned Tillman not only viral fame, but a role in an iPhone commercial. Tillman was also eventually named the Guinness World Record holder for the “fastest 100 meters on a skateboard by a dog,” a distinction that was probably made up just for the little guy. He was also a regular feature in the annual Tournament Of Roses parade. According to Davis, Tillman couldn’t do many other tricks, shunning stunts like rolling over. Instead, he showed an early interest in skateboarding and it ultimately became one of his passions. He also knew how to surf.